Description: A brand new BNSF ES44DC leads an eastbound manifest across Skyline Trestle on Montana Rail Link's Mullan Pass. Description: BNSF 7628 East leans into a curve at Elliston, Montana, on the Montana Rail Link's 3rd Subdivision. Description: Three beefy lashups all ready to go at the Delta Yard Roundhouse. Description: A westbound BNSF Pellet Train smokes it up as they throttle up. Description: Four engines lead the westbound train as the two pass side-by-side as a third train passes on the third, high line. Description: A northbound officer special with a new ES44. Out of sight to the left is the old Colorado & Southern depot, modified for use as a bus transit center. Description: BNSF ES44DC #7628 cruises past the Strong City, KS depot. 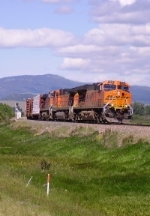 Description: BNSF 7628 prepares to take a loaded grain train up Bozeman Pass. Description: Grain train waits for a crew to take it over Bozeman Pass. Description: A BNSF stack train works up hill at Keenbrook Ca. Description: Leading an eastbound toward a meet at McCredie. Description: Heading east toward a meet at McCredie. Description: Stack train heads up Cajon Pass on track #1.